I feel like pumpkins steal all of the attention in the fall. If you give me the choice between pumpkin anything and a caramel apple, then I'm going to choose the caramel apple. 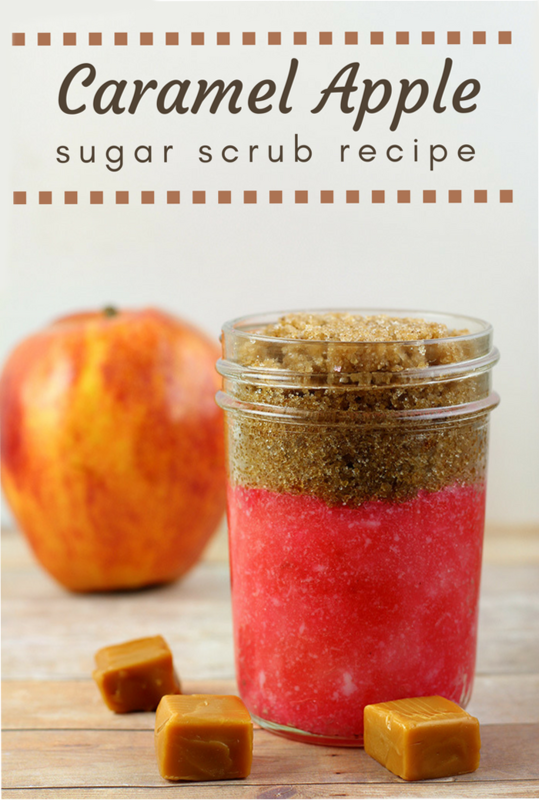 My daughter wanted caramel apples this week, and I decided that it would make a wonderful sugar scrub. A nonprofit that I'm involved with had several women volunteer for a special project, so I wanted to give them a small token of appreciation with this caramel apple sugar scrub. Since this is a layered scrub, I needed clear jars to show off the beautiful colors. I decided to order the SKS Clear Glass Jelly Jars with Gold Metal Plastisol Lined Caps. I use these jars for many things, so you've probably seen them before in my photos. I mainly use them for infusing herbs and oil for my recipes and then storing the infused oil, but I've also used them for sugar scrubs and bath salts. I like them because they have a screw on lids to keep my oils and recipes from spilling. I have several cases of the SKS Clear Glass Jelly Jars with Gold Metal Plastisol Lined Caps on the shelf because their 8-ounce size is perfect for my projects. I mentioned that I use them for my DIY bath recipes, but I also use them in the kitchen. Since they have a 70G gold plastisol-lined lid, they are perfect for storing foods. When I give someone homemade jam, I give it to them in this jar so it has a lid. 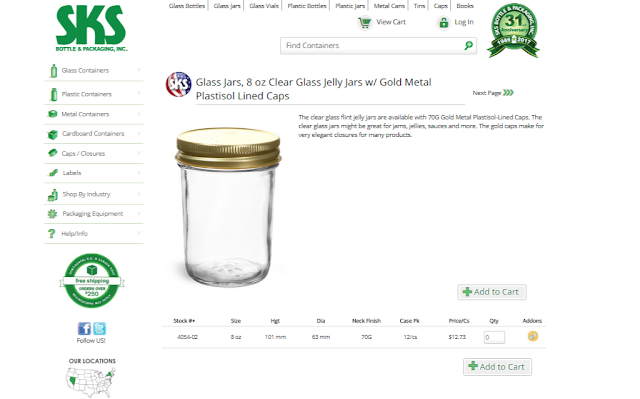 Click on the image below to order your SKS Clear Glass Jelly Jars with Gold Metal Plastisol Lined Caps. SKS Bottle and Packaging has been around since 1986. They went from a small business to a Fortune 500 company that's a leader in the industry. They sell metal, glass, and plastic containers as well as lids. They have several colors in both their glass and plastic bottles, which I love because I like to coordinate it to my project. They also have several closure styles and colors to choose from, so you can mix and match for the best packaging for your project. SKS Bottles and Packaging has a lot of unique products that I can't find anywhere else. I use their kraft push up tubes for my solid essential oil sticks and their clear jars for my unicorn snot recipe. Most of their glass jars are made in the USA, so I'm supporting American business. Most of their products are also recyclable, which is very important to me as I try to reduce my footprint. For this recipe, you'll be making two different scrubs and combining them. The measurements below will make two 8-ounce caramel apple sugar scrub jars, but you can double or triple it to make more for gifts. I used fractionated coconut oil because it's a lighter oil, but you can use olive oil, grapeseed oil, or any other liquid carrier oil. To make the apple scented layer, combine 1 1/2 cup white sugar, 3/4 cup of the oil, and 20 drops of apple fragrance oil. Add 3-5 drops of red food coloring until you get the desired color. Mix well and set aside. In another bowl, combine 1/2 cup brown sugar, 1/4 cup oil, and 1/2 teaspoon caramel extract. Stir well and set aside. Fill a SKS Clear Glass Jelly Jar with 6 ounces of the apple sugar scrub. I pushed the apple scrub down and wiped down the inside of the jar for a clean line. Then top with 2 ounces of the caramel sugar scrub. Repeat with the remaining jars. If you have one of the scrubs leftover, treat yourself to a scrub for your efforts! Be sure to check out SKS Bottle and Packaging for your fall canning and crafting needs.